I am teaching the Eightfold Path in a slightly different order than is traditional*, because two years ago when we explored these concepts, I created the analogy of the cooking pot to view the whole set of eight aspects as a helpful way to remember how these aspects work together. So this time, with a slight refinement in the analogy, we are working in the order that makes sense for building upon that analogy. We started with the ‘pot’ itself. 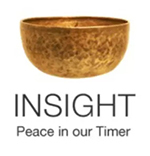 Imagine the Buddhist bell bowl that I ring at the end of meditation and that graces the masthead of my blog. The ‘pot’ holding the world in an open embrace, cupped, and that well represents Spacious View. Once we have the pot, we need a few other things to start ‘cooking.’ We need to have on hand — readily available in any moment — the match to ignite the flame of our practice and that is Spacious Intention. We need the underlying logs, the fuel that keeps the flame burning, and this is Spacious Effort, the crossed logs representing the balanced effort required to support our practice and Spacious View. Too little effort and the fire goes out, too much and all is consumed in flame. Spacious Concentration is the spoon with which we stir our consciousness, creating a vortex of clarity and focus. The consciousness inside the pot may at first be murky, like when you add sugar to water and it turns opaque. But over the flame of Spacious Effort and with the focused stirring of Spacious Concentration, the murkiness disappears and consciousness becomes clear. The result is Spacious Mindfulness. As it continues to heat, held in Spacious View, fueled by Spacious Effort, sparked by Spacious Intention, and stirred by Spacious Concentration, a naturally occurring steam rises out of mindfulness in the form of Spacious Action, Spacious Speech and Spacious Livelihood, going out to interact with the world. I like to teach the three steams last, because only when we get some clarity and awareness can we begin to notice for ourselves where we are unskillful in action, speech and livelihood. If we go there first, we can get stuck in self-righteousness, feeling we know how to be good, we’ve got this down; or we can feel scalded by what we perceive as scolding and get defensive. If we are told by a teacher that our actions, words and ways of earning a living are unskillful, without developing the clarity to see this for ourselves, we will most likely stir up a murkier, less conscious stew out of our lives, receiving the teachings as judgments, accusations that either anger us or leave us in despair. Coming from a Judeo-Christian background, as the majority of us do, these three areas can easily be taken as just another set of commandments, which would be a total misrepresentation of the Eightfold Path and its purpose. So, Spacious Concentration. It sounds like an oxymoron. That’s good! Oxymorons attract the mind, like a puzzle to play with. Zen koans seem to be oxymorons of a sort. With each new aspect of the Eightfold Path, I spend a week of investigation with replacing ‘right’ or ‘wise’ with the word ‘spacious’ and it continues to be a rich exploration. Sometimes spacious seems quite natural, like Spacious View. But concentration seems perhaps the least likely to make any sense. The word ‘concentrate’ may bring up associations that cause tension. Concentration seems to be about struggling to think really, really hard, with our brain laser focused on some problem. But in fact the traditional teachings of concentration practices, called the jhanas, were developed by the Buddha to help us create the space for a spontaneous experience, like the one he remembered having as a child. Perhaps you remember a spontaneous experience in your life of sensing a state of open awareness, a unitive state, a state of loving kindness, a state of being known as vital and valued even while being as miniscule as a drop of dew on a rose petal? This spontaneous awakening into bliss is not unusual. I’ve shared some of my early experiences of these ‘brief relief’ respites from the illusion of isolation. I imagine that many people who meditate are those who, whether they remember it or not, have had such experiences and, like the Buddha, believe they can experience it again and perhaps sustain that clarity. Here’s the Buddha’s story: The young boy Siddhartha was sitting under a tree, observing his father doing a ceremony when he found himself in a state that was both pleasurable and powerful. Powerful enough that he remembered it many years later, when he abandoned the ascetic path after six years of self-imposed deprivation, pain and difficulty. He had been phenomenally skilled at all the ascetic exercises he undertook, but knew in his heart that something was missing. We can imagine him thinking “It shouldn’t have to be this hard,” and then remembering that naturally-occurring childhood state while sitting under a tree. He decided to see if he could replicate that simple experience. So he went and sat under a tree, what we now call the Bodhi tree or tree of awakening because he set his intention to sit there until he awakened. And he did, and the rest is Buddhist history. The jhanas are specific instructions he developed for the cultivation of what I think could fairly be called a state of ‘unitive’ awareness during meditation. We have not been formally practicing jhanas, but what we do as our meditation is very much akin to it. First develop the ability to stay present with the breath, then expand that awareness so that the breath is just a part of the experience. The jhanas cultivate the ability to let go into a state that is beyond labels or words but is not lost in a fog of unconsciousness or dreamy. It may be experienced as light or many other ways, and the experience is both pleasurable and powerful enough to make a significant long term impact. As meditators we have no expectation of experiencing such a state in any given meditation. Instead we are cultivating the spaciousness of mind to receive such a state, and, at the same time, creating spaciousness in our lives, whether we ever experience bliss or not. Many Buddhist practitioners are concerned about getting attached to bliss states. This is probably why traditionally the aspect of concentration is taught last, and the jhanas are reserved for more advanced students, as they could be so easily misunderstood as escape routes. Without a grounding in fundamental Buddhist concepts and substantial practice in mediation, a person could think of the bliss state as a goal to be pursued, akin to drugged states that allow them to forget about their lives. Our intention through meditation is not to escape challenges and responsibilities, but to transform our relationship to them, to rest in spacious compassion and clarity that allows us to be fully present with whatever arises in our lives. Our intention is to be responsive rather than reactive, skillful in our speech and actions, to be conduits of loving kindness rather than purveyors of misery. The ongoing practice of Spacious Concentration can fundamentally alter the brain so that we can perceive the inner workings of the mind and have fruitful insights, which we will discuss more when we explore Spacious Mindfulness. Spacious Concentration is the practice of staying fully present, refining that focus to a fine point of stillness in the here and now and letting go of all else. The word ‘spacious’ that at first seemed to create an oxymoron when linked with the word concentration, now clearly has an important role. The very word ‘spacious’ helps to release tension in our bodies, in our minds, giving us room to let go. Developing Spacious Concentration begins with relaxation. A little metta (loving kindness) practice is very helpful to soften the tension that can build up around the prospect of concentrating. “May I be well, may I be happy, may I be at peace.” When we really feel ourselves bathed in the infinite loving kindness, this unconditional sense of good will, our muscles and minds relax quite naturally. In Vipassana (insight) meditation we focus on the rising and falling of our breath. But if we like, we can experiment with objects of focus from other traditions: a candle flame, a shell, a flower or a mantra, allowing ourselves to become fully absorbed in the experience. There are two kinds of concentration: deep absorption and open field awareness. We practice both regularly in class. Alternating between the two, giving each sufficient time to be fully felt, is a skillful way to develop Spacious Concentration. If you think about our cooking pot analogy with Spacious Concentration as the spoon with which we stir consciousness as it simmers and transforms into mindfulness, you know that there are times when you need to stir constantly, like when making risotto, and other times when you can stir and then rest from stirring, but you never lose awareness that you have a pot on the stove. In class we did more intensive concentration practices instead of discussion. I encourage you to do the same on your own. Also you might want to revisit the previous post on Right Concentration. *Traditionally teaching starts with the panna or wisdom practices of Right View and Right Intention, which we did. But then tradition takes us to the Virtue Practices called sila, which are Right Speech, Right Action and Right Livelihood, perhaps because these practices could be undertaken even without a meditation practice. Then the samadhi or concentration practices of Right Effort, Right Mindfulness and Right Concentration are taught. But again the Eightfold Path is circular, the petals of a lotus opening, so any place we start is just fine. 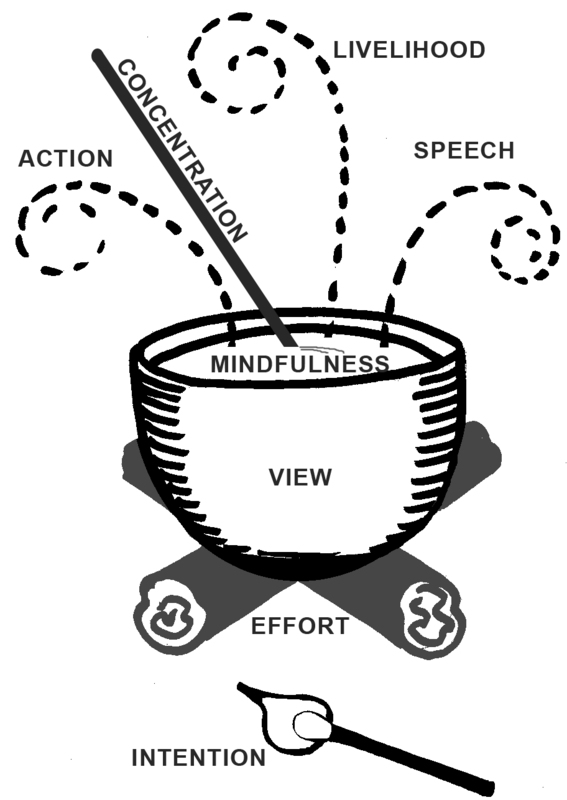 This entry was posted in Buddha, cooking pot analogy, http://schemas.google.com/blogger/2008/kind#post, jhanas, meditation, Right Concentration, samadhi, Spacious Concentration on February 23, 2011 by Stephanie Noble.